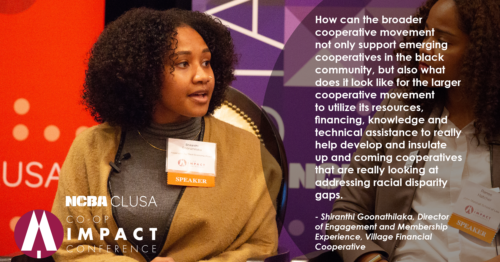 Shiranthi Goonathilaka, director of Engagement and Membership Experience at the Village Financial Cooperative, presents at the 2018 Co-op IMPACT Conference. From the civil rights history and co-ops outlined in Jessica Gordan Nembhard’s book Collective Courage to the current call for more inclusion in credit unions and the burgeoning homecare co-op movement, we are highlighting how the broader cooperative community can support co-ops in communities of color today across social media this month. Over the month of February, we’ll hear from more voices across the co-op community who can help answer that question and celebrate some of the successes. Follow along on Twitter, Facebook and Instagram (all @ncbaclusa) to celebrate with us and share. During Black History Month (and beyond!) we want to amplify voices across the co-op community to share stories, provide advice, challenge convention and support black cooperators working to build a more inclusive economy—is there a co-op or cooperator you think we should highlight? Let us know!